The Romney Digital Team set up a conference call with Senator Marco Rubio and several conservative bloggers before last night's presidential debate. Rubio is one of the best in the country at delivering the conservative message, and last night was no exception. 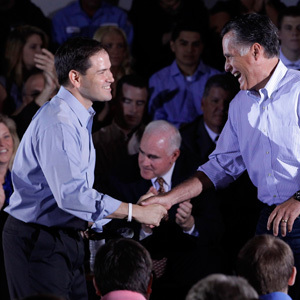 Rubio was very positive and upbeat during the call, both about Mitt Romney as a candidate, and about how he expected the Governor to do during the debate. As we now know, Rubio had good reason for optimism. One of my favorite comments Rubio made was regarding Obama's belief that big government is good for the middle class. Rubio rightfully pointed out that big government is very damaging for those who are struggling to make it, and that "the rich may not like big government, but they can afford to deal with it." I got to ask a question at the end of the call, and asked Rubio to talk about what he had seen from Romney as he had gotten to know him on the campaign trail, and I think his answer is very interesting in light of Romney's strong performance last night. Click above to listen! Thanks again to Lenny Alcivar and the Romney Digital Team for setting up this call. Make sure to follow @RomneyResponse on Twitter and check out their blog. UPDATE: Here are the links to Moe Lane's posts about the call. I'll add other links when I see them posted. Moe Lane | We won the debate; now, let’s move on to the next thing. RedState | We won the debate; now, let’s move on to the next thing.